Moths are not merely annoying. This story beautifully illustrates this by showing us how the moth earned the name “Fire Dancer” from the Aboriginal people of North America. 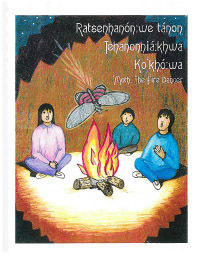 Adapted by Kawinónhsen Audrey Nelson, illustrated by Otsi’tsa’ón:we Julie Gaspe. Available in Kanien’kéha and Kanien’kéha/English. $8.00 Kanien’kéha, $9.00 Kanien’kéha & English.